The genesis of this book is itself unique–it grew out of a series of educational workshops in a predominantly Islamic area of Ghana–and this is evidenced by the traditional story structure and the cultural and linguistic references found throughout the work. The plot centers around issues of environmental sustainability and corporate development that have come to the forefront of the lives of three animal friends living along the coast of Zongo Lagoon. As an illustrated work, the images are colorful, captivating, and non-stereotypical. As a folk tale, it is both consistent with Ghanaian traditional storytelling and grade-appropriate for young readers. The story itself is relatable in cross-cultural contexts but does not neglect to highlight identifying factors of Ghanaian culture, which would likely prompt student-centered inquiry and serve as an entry point for a more focused discussion on contemporary Ghana. Furthermore, the inclusion of Hausa words offers an opportunity for students to be exposed to the diversity of ethnic groups and languages spoken in Ghana. One of the most interesting aspects of this book is the ways in which it can be applied in the classroom–both the story itself and the story behind the story offer opportunities for classroom discussions and lessons on environmental problems in our own communities, the importance of community involvement and initiative, the value of creating stories as a collective in our own classrooms, etc. Overall, the book is community-created, community-centered, and community-specific, both in its creation and plot, and serves as an excellent example of relevant literature produced primarily for a particular community but valuable to a much wider audience. HIGHLY RECOMMENDED. GIZO-GIZO! 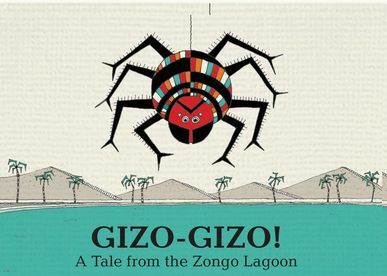 A Tale from the Zongo Lagoon is a well-written and drawn story about a group of animal friends who live around a lagoon. Spider is the laziest of the friends and begins to treat the lagoon and his friends poorly. He is warned by his friends to protect the lagoon because “it belongs to all of us.” He doesn’t heed their warning and builds a mining factory that pollutes the lagoon so much that all the animals get sick. He, himself, ultimately gets sick and that becomes his turning point. He decides to change his mining factory into a water cleaning factory and fixes the lagoon. The animals rejoice and celebrate together. The story is embedded with Hausa language words and English words that are more commonly spoken in Ghana such as water sachets, mineral bottles, milk cans. It avoids stereotypes and biased terminology and introduces customs and stories from Ghana, specifically from Zongo communities, which are areas where many Muslims in Ghana live and work. It presents a problem with a locally generated solution and uses animal characters that are under represented in African children’s books such as frogs, tortoises, crabs and fish. The story is one any child can relate to and would make a great piece for study on environmental justice, community development, and corporate responsibility. All of the animal characters used male pronouns. There wasn’t a female animal character in the book. I really do love this book and will use!